Momo Fali is one of my bloggie besties. She is always a pleasure to talk to, whether it’s on the phone, on Facebook, on Twitter, or of course, in person. (And whether we’re speaking English OR French.) I adore her. Check out Momo’s own report on how that first boot camp session went by clicking here. My word? UpYers. I swear. HILARIOUS! I showed all the people in my house! I love you Melisa! You are so FUNNY! LOVE it! You are a funny lady, Melisa! When I get up the courage to join a boot camp to get healthy, you'll be the first one I call! My word verification? "dimpl" Even your word verification knows about my thighs!! I can NOT stop watching this! You have the funniest lines! "Do we need a Ben Gay wagon?" Great way to capture your conversation and what a funny one it was! Good luck to the both of you on being healthy and adorable! I couldn't understand what was so funny until I clicked over… the vid doesn't show up at all in the feed. Hilarious, though! This is too funny! hahah. Bedazzled "Embrace The Pain" T-shirts, I'm thinking those fly off the shelf at Blogher 2011. My mother had a bedazzler when I was a child. I'm now 41 and the therapy isn't helping. To the day, at any given time she'll wear a denim shirt with some shiny something on it. What burb? We lived in Chicago (Lincoln Square) for 13 years, miss it so much it hurts sometimes. That was great! I've seen those before, but didn't know you could make your own. THAT'S how far out of the loop I am. Great job, Momo! Keep it up! STILL funny after all this time! Ohhhhh crap! I am laughing over here and I JUST DID SIT UPS and I am NOT embracing the pain very well, Melisa. Not at all. The fact that the conversation was real makes this even more hysterical. 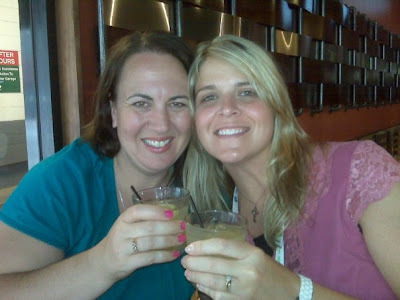 I so hope I get to hang out with you both at BlogHer. Next post: Alright, Who Ate My Feed? ?